Even the world’s most resource-rich country has now been caught in the debt trap. Its once-proud government programs are being subjected to radical budget cuts—cuts that could have been avoided if the government had not quit borrowing from its own central bank in the 1970s. Last week in Ottawa, the Canadian House of Commons passed the federal government’s latest round of budget cuts and austerity measures. Highlights included chopping 19,200 public sector jobs, cutting federal programs by $5.2 billion per year, and raising the retirement age for millions of Canadians from 65 to 67. 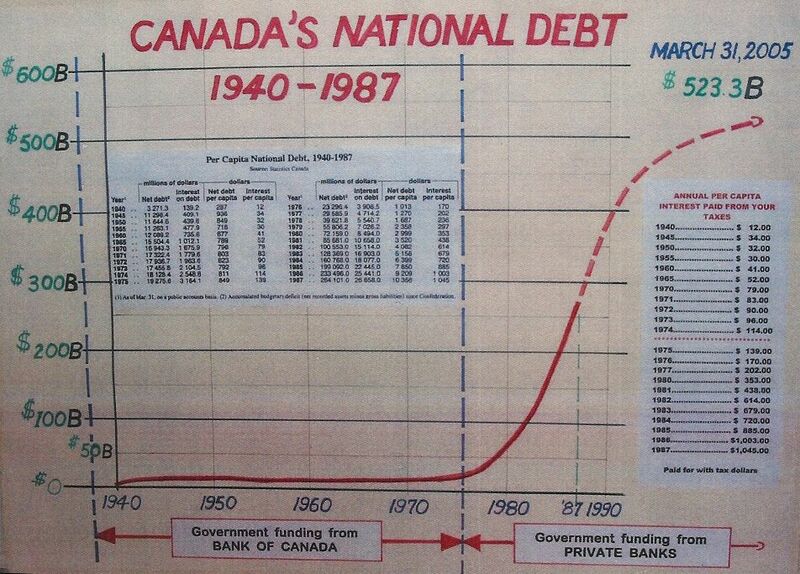 The justification for the cuts was a massive federal debt that is now over C$ 581 billion, or 84% of GDP. It seems that no gamer, lawmaker or otherwise, was offered the opportunity to toy with the number one line item in the budget: interest to creditors. A chart on the website of the Department of Finance Canada titled “Where Your Tax Dollar Goes” showed interest payments to be 15% of the budget—more than health care, social security, and other transfer payments combined. The page was dated 2006 and was last updated in 2008, but the percentages are presumably little different today. Among other cuts in the 2012 budget, the government announced that it would be discontinuing the minting of Canadian pennies, which now cost more than a penny to make. The government is focusing on the pennies and ignoring the pounds—the massive share of the debt that might be saved by borrowing from the government’s own Bank of Canada. Between 1939 and 1974, the government actually did borrow from its own central bank. That made its debt effectively interest-free, since the government owned the bank and got the benefit of the interest. According to figures supplied by Jack Biddell, a former government accountant, the federal debt remained very low, relatively flat, and quite sustainable during those years. (See his chart below.) The government successfully funded major public projects simply on the credit of the nation, including the production of aircraft during and after World War II, education benefits for returning soldiers, family allowances, old age pensions, the Trans-Canada Highway, the St. Lawrence Seaway project, and universal health care for all Canadians. The presumption was that borrowing from a central bank with the power to create money on its books would inflate the money supply and prices. Borrowing from private creditors, on the other hand, was considered not to be inflationary, since it involved the recycling of pre-existing money. What the bankers did not reveal, although they had long known it themselves, was that private banks create the money they lend just as public banks do. The difference is simply that a publicly-owned bank returns the interest to the government and the community, while a privately-owned bank siphons the interest into its capital account, to be re-invested at further interest, progressively drawing money out of the productive economy. The debt curve that began its exponential rise in 1974 tilted toward the vertical in 1981, when interest rates were raised by the U.S. Federal Reserve to 20%. At 20% compounded annually, debt doubles in under four years. Canadian rates went as high as 22% during that period. Canada has now paid over a trillion Canadian dollars in interest on its federal debt—nearly twice the debt itself. If it had been borrowing from its own bank all along, it could be not only debt-free but sporting a hefty budget surplus today. That is true for other countries as well. The powers of financial capitalism had another far-reaching aim, nothing less than to create a world system of financial control in private hands able to dominate the political system of each country and the economy of the world as a whole. This system was to be controlled in a feudalist fashion by the central banks of the world acting in concert, by secret agreements arrived at in frequent private meetings and conferences. The apex of the system was to be the Bank for International Settlements in Basel, Switzerland, a private bank owned and controlled by the world’s central banks which were themselves private corporations. Each central bank . . . sought to dominate its government by its ability to control Treasury loans, to manipulate foreign exchanges, to influence the level of economic activity in the country, and to influence cooperative politicians by subsequent economic rewards in the business world. In December 2011, this charge was echoed in a lawsuit filed in Canadian federal court by two Canadians and a Canadian economic think tank. Constitutional lawyer Rocco Galati filed an action on behalf of William Krehm, Ann Emmett, and COMER (the Committee for Monetary and Economic Reform) to restore the use of the Bank of Canada to its original purpose, including making interest free loans to municipal, provincial and federal governments for “human capital” expenditures (education, health, and other social services) and for infrastructure. The plaintiffs state that since 1974, the Bank of Canada and Canada’s monetary and financial policy have been dictated by private foreign banks and financial interests led by the BIS, the Financial Stability Forum (FSF) and the International Monetary Fund (IMF), bypassing the sovereign rule of Canada through its Parliament. Today this silent coup has been so well obscured that governments and gamers alike are convinced that the only alternatives for addressing the debt crisis are to raise taxes, slash services, or sell off public assets. We have forgotten that there is another option: cut the debt by borrowing from the government’s own bank, which returns its profits to public coffers. Cutting out interest has been shown to reduce the average cost of public projects by about 40%. Ellen Brown is an attorney and president of the Public Banking Institute, http://PublicBankingInstitute.org. In Web of Debt, her latest of eleven books, she shows how a private cartel has usurped the power to create money from the people themselves, and how we the people can get it back. Her websites are http://WebofDebt.com and http://EllenBrown.com. The Public Banking Institute’s first conference is April 26th-28th in Philadelphia. Reblogged this on Nova Scotia Power Shocks.